Mark Devereux Projects are delighted to be taking part in this year’s CG New Art Spaces Federation House: OPEN HOUSE on Thursday 26 March and hope you can make it along to see what we have been working on. In 2012 CG launched New Art Spaces, providing temporarily empty properties to artists in Greater Manchester and the North West to create and present new work to audiences. From empty retail units, warehouses, to office spaces, artists have been transforming these spaces into temporary studio and exhibition spaces. 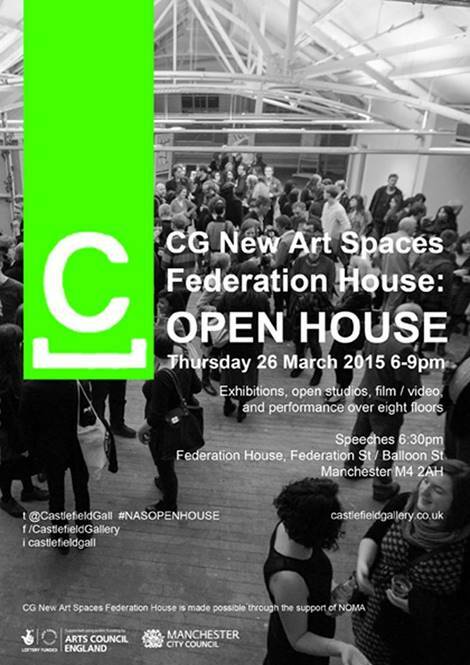 With exhibitions, open studios, video, new art and performance, join us for OPEN HOUSE on Thursday 26 March 6-9pm at CG New Art Spaces Federation House, currently CG’s flagship New Art Space in Manchester. Supported by NOMA.